Now that we’ve taken care of the kitchen and garage, it’s time to head to the bedroom. Don’t get too comfy, though. We’re not going to take a nap! 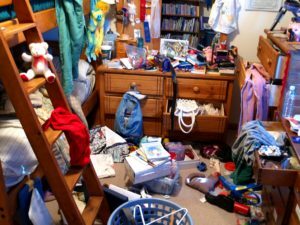 First, we have to clean out the closet, declutter your drawers and transform this messy nightmare into a gleaming clean dream. Before you get started, map out your spring cleaning plan. Our tips below will get you going in the right direction, but you’ll want to customize your list to make the most of this spring cleaning adventure. Now, let’s clean up your act and get organized! Banish the mess monster from your closet first. Start by removing everything. This will give you an opportunity to take a full inventory of what you have, what you’ll keep and what you’ll discard. Once the closet is empty, wipe down any shelves or racks, and vacuum the floor. Then, return the clothing, accessories and other items you plan to keep to the closet—organizing as you go. Arrange like items together so they’re easier to find. Place lesser-used things towards the back. Now, you can sort through the castoffs. You might donate or sell some items. Take anything that’s beyond repair or too worn and toss those in a garbage bag. Don’t cart these piles away just yet! Take the fight to the dresser, nightstand and anything else with drawers next. Empty each piece of furniture completely as you did with the closet. Go ahead and sort the items you remove—utilizing your existing piles for discarding. Dust and wipe down the furniture inside and out while it’s empty. Then, return the “keepers” in an organized fashion. Now, remove the various discard piles so you can thoroughly clean the remaining areas of the bedroom. Don’t forget the ceiling fan and light fixtures. These areas collect a lot of dust and cobwebs if you don’t stay up to date on your cleaning routine. You may need a ladder or an extendable duster. Take care of this before you clean the floor. Otherwise, you’ll just have to do the floors again afterwards. Turn your attention to the windows. If you have blinds, they’ve probably accumulated a fair amount of dust. Wipe those down. Curtains should be taken down and cleaned, too. Check the label for proper cleaning instructions or you may end up having to toss these in the discard pile. Don’t forget to clean the glass! Wrap things up with the floor. If you can’t remember the last time you had your carpet shampooed, it’s probably time. A professional cleaning service can handle this for you, or you can rent equipment to do it yourself. If your closet and drawers are still cramped for space, consider self-storage! At Storage World, we offer storage units in a variety of sizes to fit your needs. One way you can save on space at home is to store your winter clothing. Once the colder weather is gone, you won’t need the heavy gear again for several months. Get it outta there, and enjoy the extra flexibility in arranging your closet and bedroom. If you want to learn more about storing your belongings, stop by for a tour of the facilities, or give us a call! Our experienced professionals will be happy to answer any questions you may have.